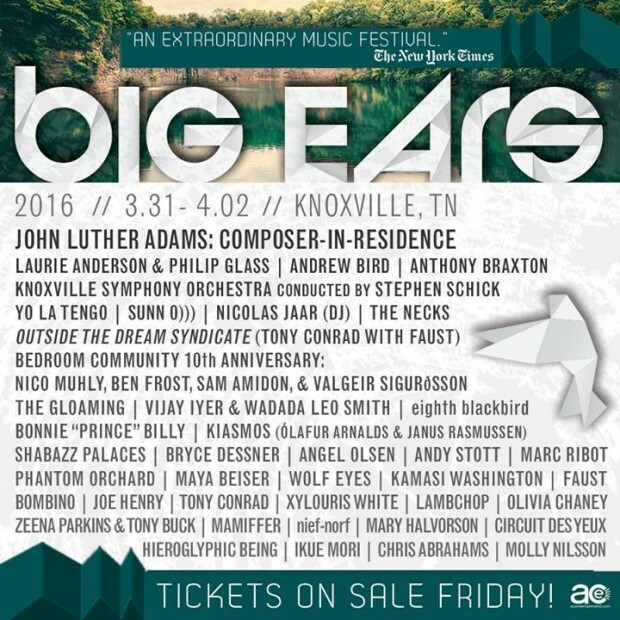 Knoxville’s Big Ears Festival Announces 2016 Lineup! Did you realize that there’s a world-class avant-garde festival that happens just down I-40 every year? If you didn’t know, now you do – Knoxville’s Big Ears Festival is one of the most diverse, classy and exciting festivals in the entire world, and it’s just a short drive from Nashville. The lineup for this year’s edition – their 5th year – just dropped this morning, and it might just be their most all-encompassing yet. Over 40 acts will descend upon Knoxville Thursday, March 31 – Saturday, April 2, including artist-in-residence John Luther Adams and a special collaboration between Laurie Anderson & Phillip Glass. Some other highlights include Andrew Bird, Sunn 0))), Yo La Tengo, Shabazz Palaces, Anthony Braxton, Nicolas Jaar, Faust and local favorites Lambchop. They will perform in venues spread around the city and include the Tennessee Theatre, Bijou Theatre, the Square Room and the Standard. Tickets start at just $139, and you can purchase them here starting this Friday. Check out the rest of the lineup and the full announcement graphic after the jump!